Blues if often played with a 12 bar structure, a so-called 12 Bar Blues. Here you will learn many 12 bar blues progressions, from the most basic ones to more complex. 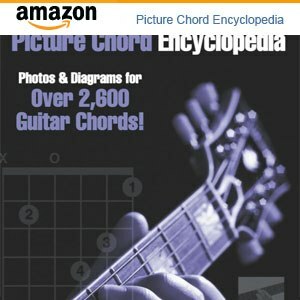 Scroll down for blues progressions in minor. This is one of the most common progressions. It isn't necessary to play E as a dominant chord, it is also possible to play regularly E majors. This is the same as above, but in another key. Try to listen to the chord changes so that you are able to know which chord it was if you heard someone else play. The IV-chord shares tones with the I-chord and is somewhat alike. The V-chord sound like it want to resolve into another chord. This structure includes an early chord change to create more variation. A turnaround includes in general the two last bars or measures. The turnaround could consist of chords or a lick (the lick could also fit as an intro). The two last bars are concerned by a so-called turnaround. The slash symbols indicated beats. In the twelfth bar E7 are played for one beat and when B7 the remaining three beats. You could use this turnaround concept on most examples presented on this page. Using an altered chord gives a different color. Notice also the D9 in the 10th bar. The E7(#9) chord with short notation: X7678X. 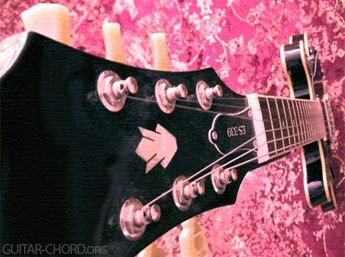 A7 and D7 is recommended to play as a barre chord. So far we have only used three chords, but here is a fourth chord (ii7) is added in the ninth bar. A turnaround could be used if wished. As always, the same interval of chords could be used in another key. The jump to A7 in the 8th bar starts a 5th intervals trip back to the tonic, which in general works well with dominant chords. Here 9th and 13th chords are used, mostly, which create a jazz feeling as well. Suggestins with short notation: XX322X (C9), XX123X (F13), XX345X (G13) and XX436X (G7#9). This is one of the most standard progressions of blues in minor. You could also try to play E7 instead of Em in the last bar. Another possibility is to play Em7 and Am7 instead of Em and Am. The same as above, but in another key. Here is an alteration of the progression above with an extra chord which makes the progression some more complex. Notice also that the iv is played in the second bar, not mandatory though. The C7-B7 sequence creates an interesting movement into the final Em chord. This is a variation of the previous 12 Bar structure, but with an expanded, chromatic sequence. The C#9 chord with short notation: X4344X (use the same shape for C9 and B9). A m7b5 chord is used, which makes the progressions sound more jazzy. The F#m7b5 chord with short notation: 2x2210. The Bm7b5 chord with short notation: x2323X.